I wanted a nice warm, subtly spiced apple cider. I could drink those little cider packets by the gallon during the winter. I find that most "jug" cider has a metallic taste so I usually prefer the packets unless I open up the wallet for the really good pressed cider. Hangsen Apple Mix is my new favorite concentrate for apple cider mixes. It's a little artificial so I add some crisp authentic apple with FA Fuji. The liquid amber turns them both a little more towards cooked and adds some depth and warmth. TFA Brown Sugar is here to mingle with the inherent darkness in Liquid Amber and turn it a bit sweet and slightly caramelized. The obvious choice for cinnamon is the king, FLV Rich Cinnamon. I use it super low here so it doesn't take over the mix and just accents it. The Apple Mix, Fuji and Rich Cinnamon together can go a bit in the dry direction so I'm boosting the juiciness with FA Pear. It also adds just a little depth to the apple. 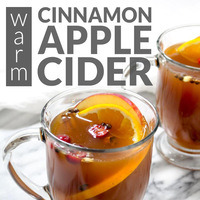 I like a little orange zest simmered with my warm spiced apple cider. It brightens up the apples and accents the cinnamon really well. I chose FW Tangerine because it's a subtle sweet tangerine that doesn't bully other flavors. It does the job of brightening this mix without being obvious. This is good shake and vape but give it an overnight steep to get really saturated flavor. The lord has answered my mulled cider prayers with this one channeled through kindground! I had to sub the fw tangerine so I used cap sweet tangerine and so I didnt mix this 100% but all the proper parts are there: warm spiced apple with accents. I loved the LA/Fuji combo already but have always used it without the support of other apples. This combo here with apple mix and fuji at these ratios is a keeper. it's a bright apple flavor that works perfectly with the spices. Rich cinnamon adds some warmth without getting crazy and the sugar/SS combo just makes this sweet, rich and deep. I think there's probably room to play with the citrus accent here and CAP sweet tangerine at 1% probably was a bit conservative of me for a sub. I only wish I had mixed this in the fall! Thanks, KG.